Next Post > Next post: Unlockable Bonus Items & Locations in Sonic Generations? Lol i wonder how many ppl got that refrence? He’s talking about the review of Sonic the Hedgehog Genesis on Youtube by somecallmejohnny but he’s referencing the wrong hat. Hell yes, Johnny’s reviews are amazing. I got it. Nice one. PS3 games aren’t region locked no. Looking at the T&C’s now and it seems it’s only open to Australian residents unfortunately. Is it just me, or does the hat look like it’s made out of a different material than the colours one? By the way I already have the hat and I see no reason to get the pre-order. Oh, well. It’s a nice idea for people who don’t have one already. I’ll wear the hat to work, bugger it. Not that stupid effing hat again…they probably have a warehouse full of those ridiculous pieces of crap and saw this as a prime opportunity to get rid of them. 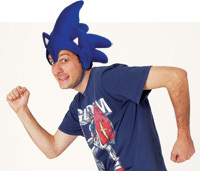 If this is seriously our pre-order….for Segas tribute to the blue blur….. i’ll be damn pissed off. Isn’t that picture of the Sonic hat above, not that comedian who was on The Blurb and got to wear the Sonic hat?